NGO News blog, NewsLine: Follow up of rescued children should be given top priority in the area of care and protection of a child. Follow up of rescued children should be given top priority in the area of care and protection of a child. 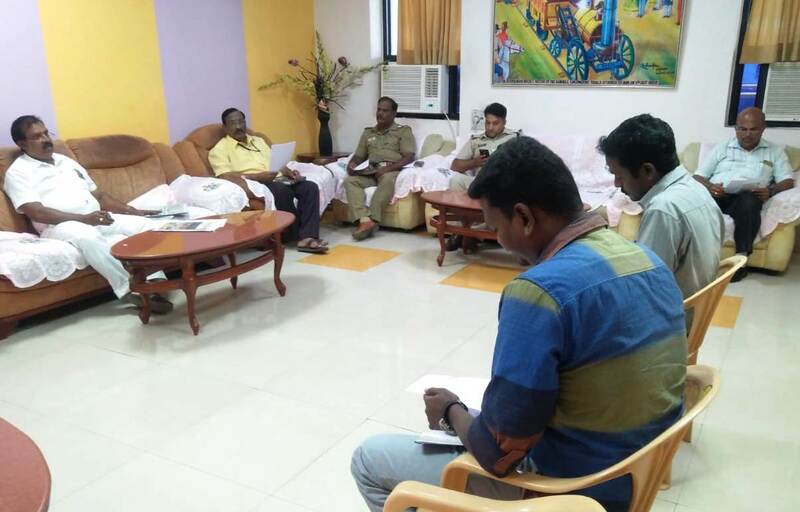 "Follow up of Rescued children are to be given utmost importance for care and protection of the Children" shared by Shri.N.Muthukumar,Station Manager of Trichirapalli Railway Station Manager. 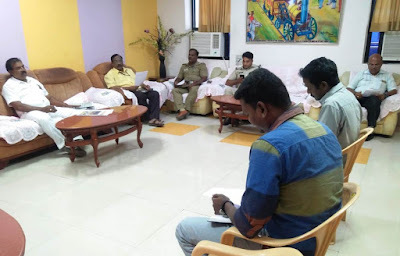 Shri..N.Muthukumar.Railway Children India, (RCI-SEVAI-Society for Education Village Action and Improvement) Child Help Group (CHG) meeting for the month of October 2018 was conducted on 30, October in SMR Chamber, Railway Junction, Trichirapalli, Southern Railways Division.Mr.N.Muthukumar, Station Manager, Railway Junction, Trichirapalli presided over the CHG meeting. The Station Manager appreciated the good work done by RCI-SEVAI and appealed all the stake holders to help the RCI-SEVAI and Railway for the rescue the children in need of Care and Protection. K.Govindaraju, Director SEVAI presented the data of the rescued children in need at Trichy Railway Junction. Director SEVAI reported as of 30th Oct 2018 since January 2018, 657 children have been rescued, out whom boys were 599, girls were 58. The rescue for the month of September was 70, boys were 61 and girls were 9 and for the month of October as of date the rescue was for 62 children, out of whom boys are 51 and girls are 11. RCI-SEVAI Counselor Sukumaran reported that 493 children are in follow up.Mr. Muthukumar congratulated RCI/ SEVAI, the RPF Personnel and Commercial Staff associated with Trichirapalli Railway Junction those were felicitated by Shri.R.K. Kulshrestha, General Manager, Southern Railway and Railway Children in the esteemed presence of Shri P.K.Mishra, Addl General Manager, Shri Birendra Kumar, Principal Chief Security Commissioner- RPF, Shri Sanjay Tiwari, Strategic Alliance Manager, Railway Children NGO and other invitees for their outstanding contribution for protection of children. Mr. Muthukumar, Station Manager, Railway Junction an article appreciated about the facilitation program in local Daily in English and asked RCI-SEVAI to display the article in an enlarged size so that the stake holders and passengers/public will be able to understand the role of Child Help Desk rescuing the children in need for Care and Protection. Mr. Muthukumar, Station Manager, Railway Junction also suggested honouring the grass root level stake holders in near future in an appropriate date and time by RCI-SEVAI. The Station Manager appreciated for the follow-up; after rescue and sheltering children undertaken by RCI-SEVAI personnel. RCI-SEVAI Counselor Sukumaran highlighted that 493 children are in follow up. Mr.Murali Kumar, Outreach Coordinator, RCI- SEVAI stated that 657 children were rescued successfully with the support of Railway stake holders on average of 2- 3 rescuing children a day. Mr.Sujit Kumar Roy, the Inspector of RPF stated that RPF will work hand in hand with RCI-SEVAI in rescuing children those need care and protection from trains and Railway premises and hand them over to the safe and secure hands of Approved NGOs Such as RCI/SEVAI,Child Welfare Committee, other legal rehabilitation institutions established by Law as per the Railways Standard Operating procedure (SOP), to ensure care and protection of children in contact with Railways jointly developed by Ministry of Railways , National Commission for Protection of Child Rights (NCPCR) and Ministry of Women and Child Development. Mr.Sujit Kumar Roy assured that his office will his fullest cooperation for rescuing children those are need of care and protection. However, the Inspector of RPF conveyed that CWC is the legal body to deal with rescued children, those need care and protection.